The labial bow is one of the most important ac-tivatable spring components of orthodontic appliances and is used in both the maxilla and the mandible (Fig 10-45). However, it can also take on a retentive function. The labial bow is used as an active spring component for aligning the anterior teeth to create a harmonious dental arch or as a retentive component in distal movement of posterior teeth. As an active component, it can be placed against the incisors under tension for retrusion of the anterior teeth. It is also placed under tension when individual teeth are to be rotated, supplemented either by a protrusion spring to form an eccentric couple or the milled plate edge for punctiform placement.The effect of the labial bow under tension can be varied by positioning the plate edge and the bow at different heights in relation to the tooth so that this two-point application of force enforces eccentric tipping of the teeth. The labial bow can also lie against the anterior teeth without tension when the whole anterior section is moved by the split plate and when the position in relation to the plate edge is to remain fixed. When the anterior teeth protrude, the labial bow can also stick out to keep the lip away from the teeth and hence minimize lip pressure. The following paragraphs describe the components of a labial bow. 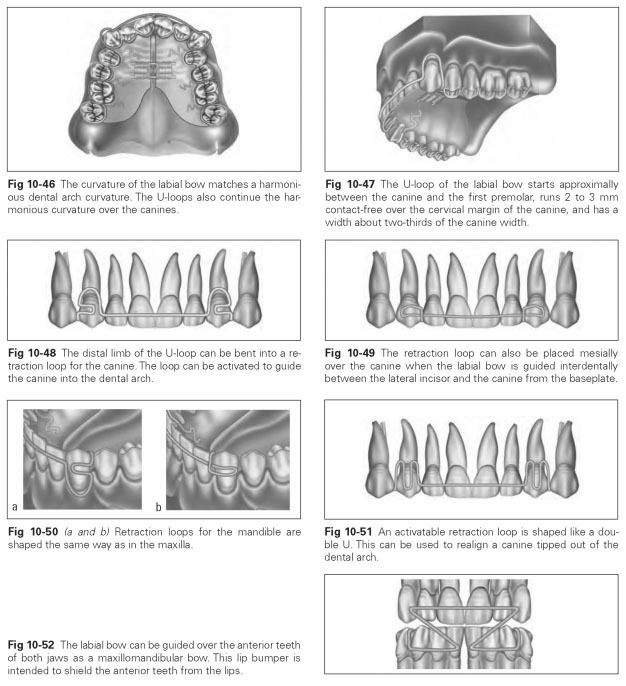 The horizontal part is harmoniously curved to match the ideal dental arch form and at the incisors runs along the incisal third from the mesial third of one canine to the mesial third of the contralateral canine (Fig 10-46).To achieve a harmonious curvature, this section is bent with the fingers and not with pliers. The horizontal part of the bow can be expanded by soldered springs for single-tooth movement (eg, by mesial and distal springs to close spaces between teeth).The labial bow may also be covered with plastic—as a passive retentive component— to fix the position of all the anterior teeth or individual incisors. This covering can also be applied at a later stage. U-loops continue the harmonious curvature of the horizontal part. The U-loops are formed by bending the labial bow at the mesial third of the canines at right angles in a cervical direction. The loops protrude about 2 to 3 mm above the cervical margin. The loop width is roughly equivalent to two-thirds of the canine width because the distal limb of the loop must be bent approximally between the canine and the first premolar into the transverse part (Fig 10-47). The length of the U-loops is roughly equivalent to canine crown length. The loop serves to activate the labial bow and can help to correct the position of the canine. A retraction loop is a loop in the distal limb of the U-loop that is guided over the labial surface of the canine at its equator (Figs 10-48 to 10-51). Thus, the U-loop can be exploited for movement of the canine by being shaped to form a loop guard. A loop guard can also be shaped by placing the U-loop in a wavelike fashion over the labial surface. 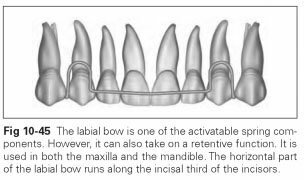 The whole labial bow can be guided wavelike over all the anterior teeth, where it acts as a lip bumper (see Fig 10-52). The labial bow curvature must have a harmonious dental arch form. It runs along the incisal third of the incisors. The U-loops must bend at right angles at the mesial third of the canines. The limbs of the U-loop must run parallel and have the right height and width. As an active anterior spring for retrusion of incisors, the labial bow is guided between the lateral incisor and the canines and is shaped from 0.6-mm wire. In this popular version, the movement of the labial bow takes place in harmonious shaping over the canine; a retraction loop is then guided as far as the approximal area of the lateral incisor and canine, then the wire crosses over the transverse part.This produces an activatable loop guard for canine as well as incisor movement. As a maxillomandibular bow, the labial bow made of 1.2-mm spring hard wire can be bent for maxillomandibular function (Fig 10-52). The wire formed of enlarged U-loops is guided from the maxilla to the mandibular anterior teeth.